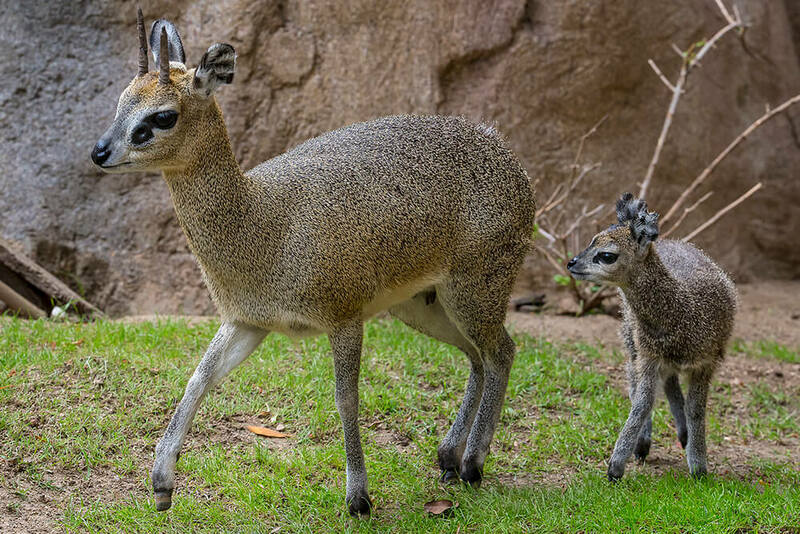 Nimble, quick, and sure-footed, the klipspringer springs from rock to rock in search of tasty browse. 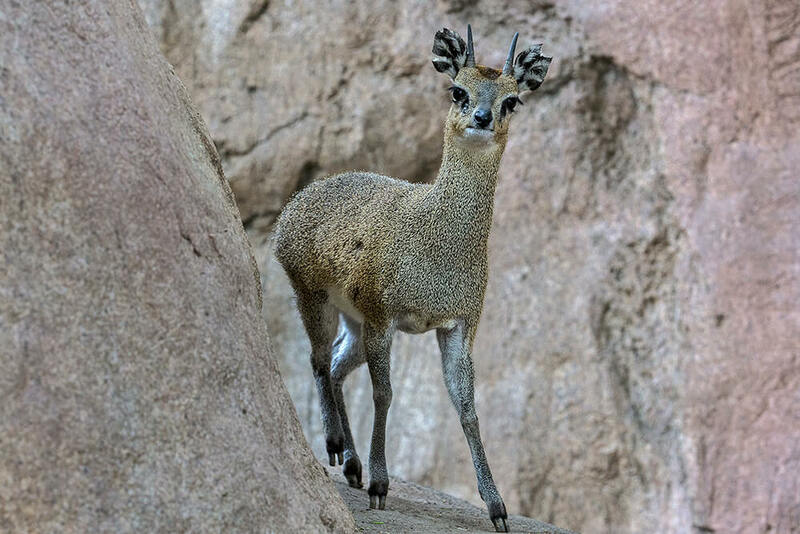 This type of dwarf antelope lives among rock formations in Africa called kopjes, (pronounced ko-pea), a Dutch word meaning “small head.” This is a great description of how the ancient kopje rock formations jut from the savanna floor, providing excellent vantage points and shelter for its residents. Kopjes of the Serengeti are home to a wide variety of mammals, reptiles, birds, and invertebrates. Even leopards take refuge in these “islands of life” in the savanna. Nice to Meet You. This hollow-horned ruminant is about 2 feet (0.6 meters) tall at the shoulder and weighs 22 to 40 pounds (10 to 18 kilograms). While it is fleet-footed, it can also stand stock-still for long periods of time. It has a stiff coat of fur made of hollow, brittle hairs ranging in color from gray, brown, and yellow, to olive green giving the animal a grizzled appearance. This type of fur also insulates it from the blazing heat. Belly, chin, area around the lips, and inside of the ears are pale to white. It has a sturdy build and well-developed hindquarters. Its hooves are small, almost dainty giving it the appearance of standing on its tiptoes. Short spikey horns jut from the males’ head; both sexes have horns in some species, which can be up to 6 inches (15 centimeters) long. Hoofing It. 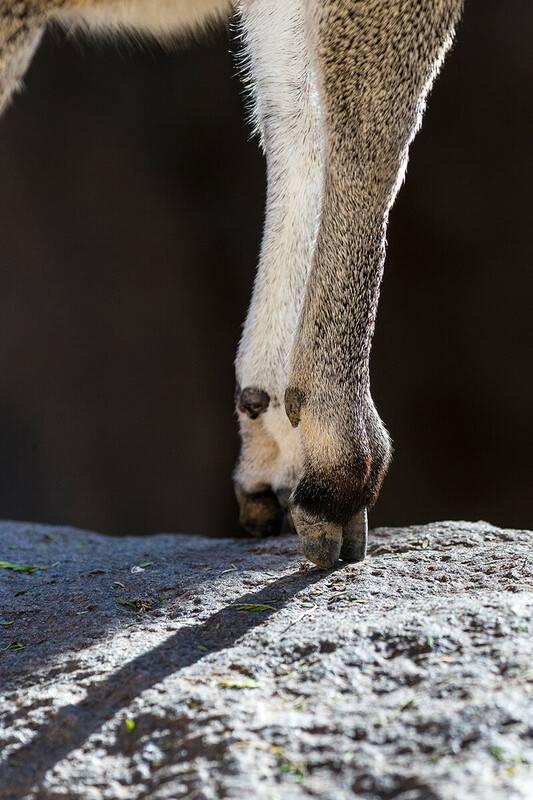 One the klipspringer’s most notable characteristics is its hooves. With each about the diameter of a dime, this pint-sized rock hopper can jump onto a landing pad the size of a silver dollar. Its delicate-looking feet are specially adapted for traction on rocky surfaces, with a slight suction-cup effect. On the Rocks. Klipspringers are at home in rocky terrain, particularly kopje areas, but will thrive in riverbeds, rocky hills or outcrops, and even mountains as high as 13,000 feet (4,000 meters). They can travel over 6 miles (10 kilometers) along flat land to reach another kopje. Rocky Home Life. 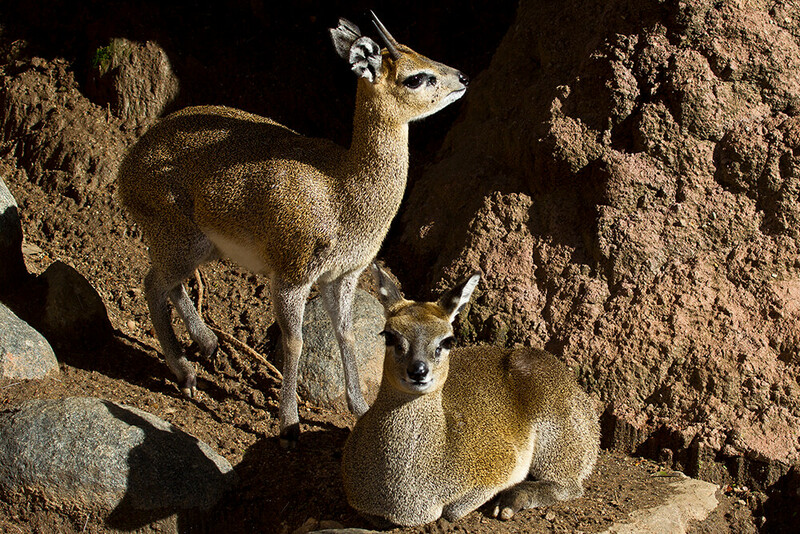 The klipspringer holes up in its chosen kopje or other rock-filled habitat. It does not build a nest or den. Klipspringers wisely hunker down during the hottest hours of the day, but forage during the early morning hours and late afternoon. Look Out. While living in a kopje jutting from the savanna floor it can be easier to keep an eye out for predators. Sometimes a klipspringer pair takes turns eating so the other can “watch their back” as they browse. When alarmed, the sentinel lets out a shrill whistle to alert others. But danger lurks including leopard, caracal, serval, hyena, jackal, and large snakes. Youngsters are hidden in rock crevices for the first few months of life to keep them out of harm’s way. Adult klipspringers are agile, quick, and sure-footed, which helps them dodge danger. Just Browsing. Klipspringers are active mostly during the early morning and late afternoon hours, resting during the hottest part of the day. During this time they consume leaves, blossoms, fruit, and lichen. At the Zoo they receive browse and a tasty ungulate pellet with vitamins and minerals. Smell that? Klipspringers communicate with whistles when alarmed. They stand still and erect for long periods of time, presumably watching out for predators. They use scent to communicate with outsiders, marking territory with dung piles and excretions from a preorbital gland, a dark, slit-like area beneath each eye. Pairing Up. These small antelope form solitary, monogamous pairs, or a family group with a yearling. A male may make a low humming call and arch his neck as a dominance display. Animals in zoos have been observed to mutually nibble on preorbital glands (where its scent is formed). Some klipspringer species (like the Transvaal) have a strong courtship and breeding seasonality, while others like the Cape klipspringer are more flexible if conditions are favorable. After breeding, the female gives birth to a single offspring about six months later (she can give birth every 16 months). Visit our klipspringers in Africa Rocks at the African Kopje. They share their rocky exhibit with dwarf mongooses and rock hyraxes, much as they would live in the wild. While the klipspringer is listed as a species of Least Concern on the International Union for Conservation of Nature (IUCN) Red List of Threatened Species, it is important for all of us to help wildlife and the environment when ever we can. As human populations increase and resources become scarce, our actions (or inaction) can have far-reaching consequences. San Diego Zoo Global is committed to lead the fight against extinction for species far and near. You can help by supporting San Diego Zoo Global Wildlife Conservancy. Together we can save and protect wildlife around the globe. 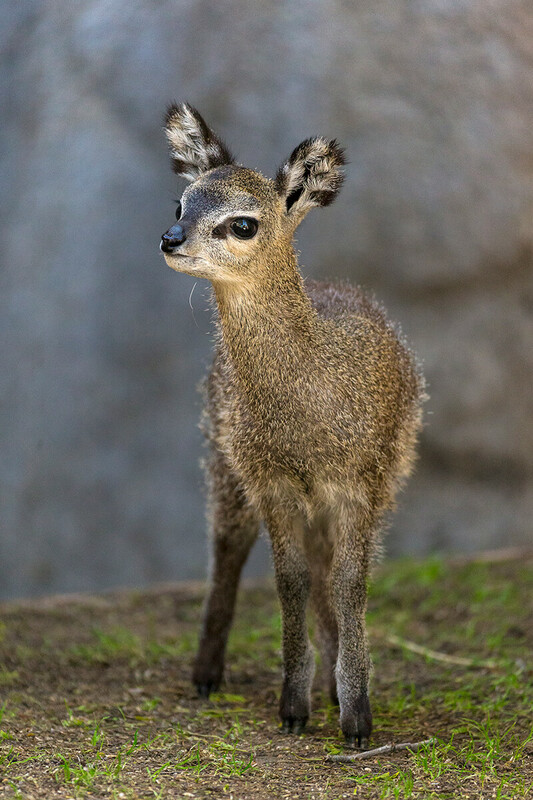 Baby klipspringers are “hiders” for the first 2 to 3 months of life, likely due to predation by eagles searching for rock hyrax that share the klipspringer’s habitat. They mark their territory with dung middens and gooey, tarlike globules from their preoribital glands, which is dabbed onto branches. 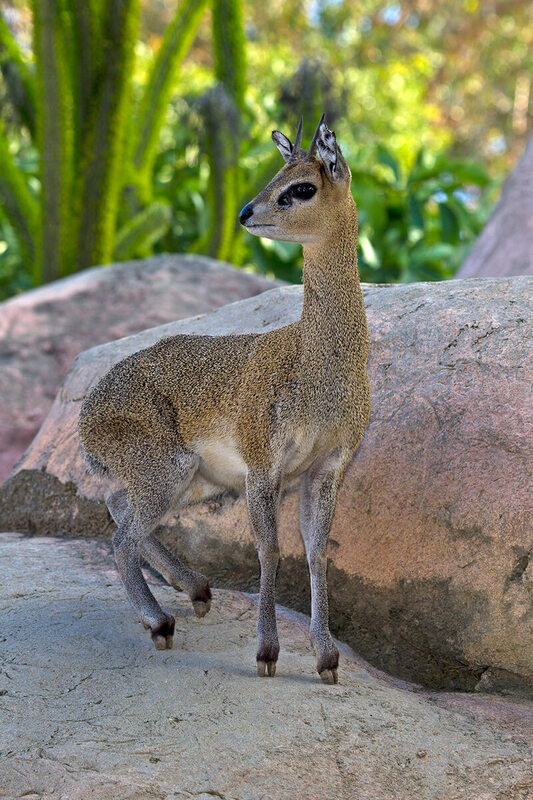 According to The Handbook of the Mammals of the World, there are 11 different species of klipspringer, based on where they live in Africa. Their scent marks last about a week, after which they circle their territory again and remark boundaries.